The monthly meeting of the Manhan Rail Trail Committee will be held Monday, April 29, 2019 at 7:00 PM in the upstairs conference room at the Easthampton Municipal Building, 50 Payson Ave., Easthampton. 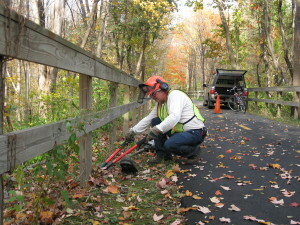 Items on the Committee agenda usually include maintenance issues and ideas for improving and expanding the trail. All meetings are open to the public and we encourage trail users to stop by and give us some feedback! Please join us for the annual trail mulching party on Saturday, May 4, 2019, 8:00 – 10:00AM. Please meet us on the trail at the mural between Payson Avenue and Union Street, Easthampton. Please bring your own gardening or work gloves, and whatever tools you can muster (rakes, shovels, clippers, loppers, hand saws, Wheelbarrows.) The city provides trash bags. Don’t forget your water bottle and sunscreen! Questions? Call Barb LaBombard: (413) 529-1460. Also, on Sunday, May 5, the City of Easthampton will be hosting a Clean Up Day and volunteers are needed to clean up trash and branches along other sections of the trail, especially from Coleman Road to Payson Avenue and from Union Street to Ferry Street behind the mills). More info on Sunday’s event will be posted soon. It’s a great opportunity to meet some other like-minded folks and help maintain the trail. Hope to see you there one or both of those days! 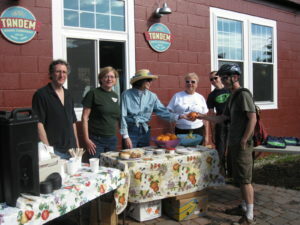 All trail users are invited to take a break and stop by for a snack Saturday, May 11 between 11:00 – 1:00 on the trail next to the Tandem Bagel between Union Street and Payson Avenue. Some light refreshments will be served free of charge. It will also be a chance to chat with Manhan Rail Trail committee members and enjoy the comaraderie of other trail users. Hope to see you there! 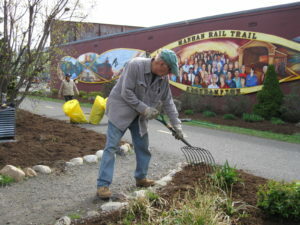 Based in Easthampton, Massachusetts, the Friends of the Manhan Rail Trail is a nonprofit organization dedicated to preserving, beautifying, and enjoying the six-mile paved recreational path that runs through our city and connects to other trail networks in the region. Learn more, or email us.